Various Updates and a chance to win a copy of Mission: Tomorrow! I did not win the Canopus award. It went to Ken Liu’s “The Waves” as I predicted it would. He 100% deserves it. “The Waves” is my second-favorite Ken Liu story (after “The Paper Menagerie”) and I was kind of surprised not to see it on the major award ballots last year. 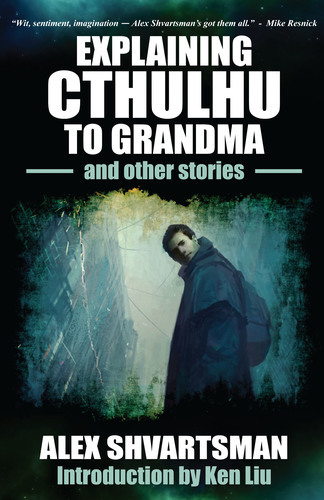 Before the Canopus was even announced I asked Ken to include this story in Humanity 2.0, an anthology I’m editing for Arc Manor which will be published next year, and he agreed. I can’t wait to share it with readers who may not be familiar with it yet! I loved the 100 Year Starship Symposium. It was an opportunity to meet with some incredibly smart people from NASA, SETI, and private space companies and listen to presentations on a wide array of subjects which I will be sure to use in future stories. The hotel which hosted the symposium also hosted the New York Jets that weekend, as they prepared to play the Raiders. The huge hotel lobby with clusters of rocket scientists and clusters of huge athletes was an amusing dissonance to observe, to say the least. And the scientists know how to have fun too — the Halloween party was a hoot! With Dr. Mae Jamison at the 100 Year Starship Symposium Halloween party. My next trip will be to Philcon in a little over a week. I will post my schedule prior to the event. Nature selected my story they published last month, “Staff Meeting As Seen By the Spam Filter” to be featured on their podcast. You can listen to it here. Mission: Tomorrow, which includes my Canopus Award finalist story “The Race for Arcadia” was officially released earlier this month. You can read the first four stories (including mine!) in the sampler here. This anthology is excellent and has been highly praised at Locus. Read the first four stories from Mission: Tomorrow here. (Click the Next link at top right of each page to navigate). You can also win an e-book copy of Mission: Tomorrow right here on my blog! Simply comment on this post between now and Wednesday, November 18. On November 19 (which also happens to be my birthday) I will randomly select one person to receive an e-book. If 10+ people comment, I will give away two copies instead.